New attractive contemporary square design – more aesthetically pleasing with increased soap/fluid reservoir. Tough and robust – Casing manufactured from 100% Grade 304 18/10 Stainless Steel. Durable construction - Vandal Resistant. Cost-effective – A generous 1,4L reservoir capacity provides in excess of 1100 single 'shot' washes. Recessed flip-over locking system – convenient open/lock key method – quick and easy conventional refill. Neat and tidy appearance – securely mounted on Stainless Steel wall-plate. Functional – superior new push button operation. Incorporating an improved totally reliable "multi- purpose" Soap and alcohol friendly dispensing valve. Totally hygienic – easy to clean and maintain Stainless Steel body. 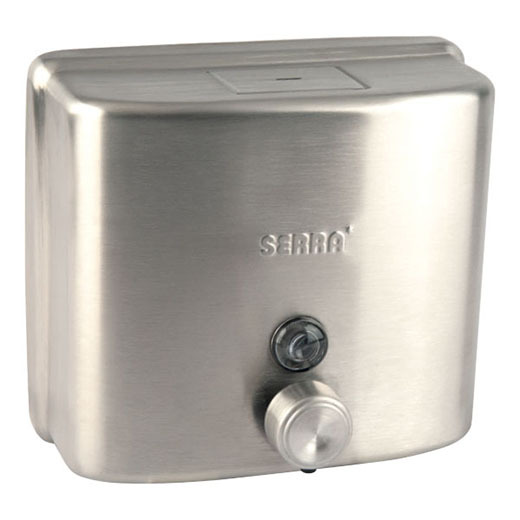 Serra Nox SQ soap dispenser – ten (10) year limited warranty. An essential up-market accessory for multi-purpose applications where high hygiene standards are required.